The American Dairy Goat Association welcomes your participation in the 2019 American Fresh or Powdered Goat Milk Bath and Body Care Products Competition to be held at its Annual Convention in Boise, Idaho in October. This competition will be open to all soap makers. Awards and $200 & $100 gift certificates will be given for the Best in Show & Reserve Best in Show in both the Basic Bath Care Products & Creative Aesthetics Bath Care Products Divisions. Ribbons will be awarded to 1st – 3rd place winners in each division. Entries will be judged by Silvia Victory and Marcia McChrystal, both from Idaho. Entries will be showcased at the Goat Products Reception. Both Convention attendees and the Boise area public will attend this event. Since this event is intended as a promotion for Goat Milk Products, we encourage producers to include small amounts of promotional materials and distributor information along with their entries. These promotional materials will be withheld during judging and placed with products at the Reception. All entries in the gift package division will be auctioned during the reception. Only products that include fresh or powdered goat’s milk are eligible to compete in this competition. For entries received by September 19, 2018, the entry fee will be $10.00 per entry. Entries after September 19 will be $15.00 per entry. Gift Baskets are free. Products MAY NOT include pre-made bases; bar soaps MAY NOT be made from melt and pour bases. Bar soaps may include any combination of tallow, lard and/or vegetable oils. Fragrance will be defined as any fragrance oil, combination of fragrance oils, or combination of essential and fragrance oils. Miscellaneous Body Care Product will be defined as a product containing fresh or powdered goat milk that doesn’t qualify for any other classes in this competition. Products may only be entered in classes that they qualify for. If in doubt about a class, contact Karyl Dronen. Please fill out one entry form for each product entered. All entries will be displayed at the Goat Products Reception. Please send promotional material or placards in shipping container(s) with your product. PLEASE DO YOUR ENTRIES ONLINE USING GOOGLE DOCS, https://goo.gl/forms/fksR5d7nNNLDoUSE3 PLEASE PAY ADGA DIRECTLY BY ADDING ENTRY FEES TO YOUR ACCOUNT. IF YOU ARE NOT AN ADGA MEMBER AN ACCOUNT WILL BE CREATED FOR YOU ON THE ADGA.ORG SITE. NO OTHER FORM OF PAYMENT WILL BE ACCEPTED. ENTRIES WILL NOT BE PROCESSED UNTIL PAYMENT IS MADE TO YOUR ADGA ACCOUNT. Please send entries without packaging or any other identifying material unless otherwise specified. When entry forms are received, printed labels with unique identifying number and category will be sent to you. Place these labels on each of the products that you are entering in the contest before shipping them. 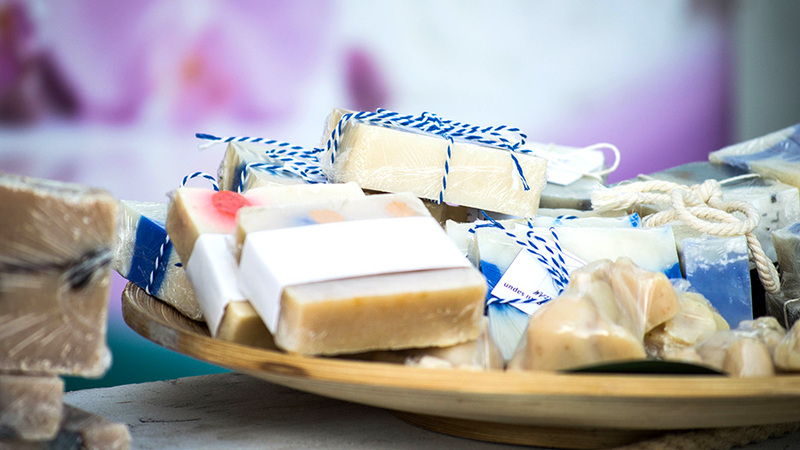 Send one bar of soap or one small individual container of other products, for judging and one normally packaged soap bar or product for display at the reception. Gift packages may contain a combination of any products produced by the entrant plus non product items. Entries for the Bath Care Products Competition must be onsite by 3 p.m., Monday, October 14, 2018. Hand delivery may be made by prior arrangement with the committee. Packages must include a packing slip containing number of packages shipped and number of items in each box. Please include your company or brand name for the items you have entered. This competition puts emphasis on the creativity of the products, color or colors, how the scent matches the products look and packaging. Packaging may include everything except the producers identifying label. The quality of the bath care product will also be judged as in the above categories. I have developed a fresh goats milk all-in-one shampoo/body wash. Would this go in the miscellaneous category?